What impact is The Womanity Foundation having on the lives of women and girls globally? Over the past 10 years since our inception, 33,000 children in 15 public girls’ schools across Afghanistan have accessed a quality education. Meanwhile 1,111,068 girls in India have been impacted by the Educate Girls outreach. 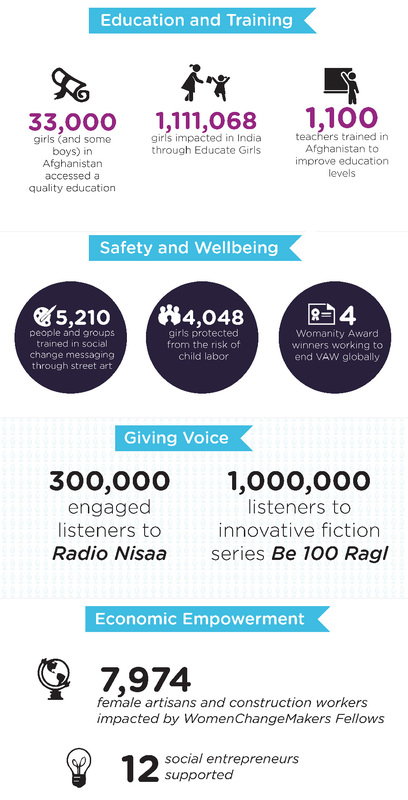 Since its launch in 2010, the audience of Radio Nisaa – the Middle East’s first women’s run commercial radio station – grew from 2% to 15% (based on a sample of interviews) reaching in 2015, an estimation of 300,000 listeners in West Bank and Gaza. Meanwhile 7,974 artisans and construction workers in Brazil have had their livelihoods and financial independence enhanced by WomenChangeMakers Fellows. These are just a few of the powerful statistics, set out in our newly released 2015 Annual Report, which illustrates the benefit that Womanity’s programs and team are having on the lives of thousands of women and girls and their communities. Womanity continues to accelerate innovations to enhance the lives of women, girls and their communities. The work of the Womanity foundation only takes place with the generous contributions of its supporters. Make a donation to Womanity’s life changing work with women and girls around the world and help foster more inclusive, and productive communities in 2016 and 2017. You can donate online or email ryna@womanity.org to discuss your charitable giving.